The owner of the online store elektroonika24.ee / elektroonika24.lv (hereinafter referred to as the online store) is Electronics OÜ (registration number 12091054), located at Sõpruse pst 25, 10615 Tallinn, Estonia. Add the desired products to your shopping basket to order them. Fill in all of the required fields and choose the most suitable shipping method to complete the order. The total cost is then displayed on the screen. This can be paid via an online bank transfer or using another payment method. All payments made with any payment method are processed in euros. 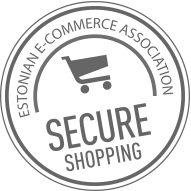 In Estonia, the following bank links and payment solutions are available: Swedbank, SEB, Liisi payment plan, LHV payment plan, PayPal, bank transfer, payment in shop in cash / with bank card. In Latvia, the following bank links and payment solutions are available: Swedbank, SEB, Citadele, Luminor, VISA/Mastercard and bank transfer. We will send the personal data required for making a payment to the processor Maksekeskus AS. Parcels within Estonia will usually reach the destination chosen by the buyer in 2–3 business days after entry into force of the sales agreement, via Itella SmartPost parcel terminals or DPD courier service. Parcels in Latvia will usually reach the destination chosen by the buyer in 3-5 business days after entry into force of the sales agreement, via DPD courier service. After receiving the order, the purchaser has the right to withdraw from the contract entered into with the e-store within 14 days. To return the goods, you must submit a declaration of withdrawal to the e-mail address info@elektroonika24.ee within 14 days of receiving the goods. The purchaser has the right to turn to the online store within two months of the occurrence of a defect by e-mailing info@elektroonika24.ee or calling +372 5644524.